Lester M. Stern, 86, Wahpeton, ND, passed away Friday, June 14, 2013 at Sanford Health, Fargo, ND. The Funeral Service will be Thursday, June 20, 11:00 a.m., at St. John's Catholic Church, Wahpeton, ND. Visitation will be Wednesday, from 5 PM to 7 PM with a 7 PM Masonic Service at Vertin-Munson Funeral Home, Wahpeton. There will also be visitation Thursday, one hour before the service at the church. Interment will be at Fairview Memorial Gardens, Wahpeton. Lester was born on July 29, 1926 in Wahpeton to Hugo and Martha Stern. He graduated from Wahpeton High School in 1944. He served in the United State Navy during WW II. 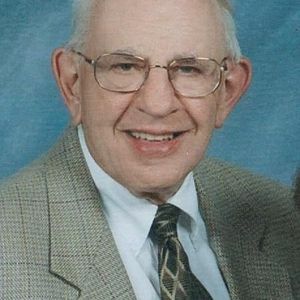 He received an Associate Degree in business from the North Dakota State School of Science in 1948 and then attended the University of Minnesota. He married Patricia Koenig of Breckenridge, MN in 1965. In 1950, he joined his father and uncles in the family business, The Stern Clothing Company. Stern Clothing was founded in Wahpeton, Dakota Territory in 1882. Lester served as president of Stern Clothing from 1970 until his retirement in 1992. During his tenure as president, Stern Clothing celebrated its centennial anniversary and opened stores in Lidgerwood and Fergus Falls, MN. In his retirement, he worked as an assistant for Red River Human Services. From 1975-1982, Lester served on the North Dakota State Board of Higher Education, presiding as its president in 1980-1981. He was a director of the First National Bank of Wahpeton. He also served as past president of the Wahpeton Chamber of Commerce, past president and charter member of the Wahpeton Kiwanis Club, president of the Golden K club, chairman of the Elks Lodge, chairman of the North Dakota State School of Science stadium fund drive as well as chairman of the United Way Fund drive. Lester was active in the American Legion and its military unit 40 & 8. He is a past master of the Wahpeton Masonic Lodge and is a past lodge treasurer and state committee member. He was also a member of the Eagles. Survivors include his wife Patricia of Wahpeton, son David (Lisa) Stern and their children Max and Samuel of Santa Monica, CA, daughter Becky (John) Klava and their children, Isabel and Isaac of Fargo, ND and a sister, Barbara Neumann and her family of Augusta, Georgia. Lester was preceded in death by his parents. Fairview Memorial Gardens, 11th Street, Wahpeton, ND Interment for Lester M. Stern https://www.tributes.com/obituary/show/Lester-M.-Stern-95994883#services https://www.tributes.com/obituary/get_ics/95994883?service=2682686&tr= Interment at a later date. I am so sorry to hear of the loss of your husband and family member. Thoughts and prayers are being sent your way. Dear Pat and Family.. I am so sadden to hear of Lester's passing. Pat, I wish I was back there so I can give you a big hug. Lester and you have always been very dear to me. I, along with many, shall remember him with many smiles and giggles.,, I send much love and Prayers..
Pat, David, Becky and families - Sorry to hear of the loss of Lester. I remember him always having a smile on his face and being involved in many things in Wahpeton. My thoughts and prayers are with all of you during this time. Cherish the memories!